This gentle eye cream with hyaluronic acid is specifically designed to provide intensive care and anti-aging benefits for the delicate area around your eyes. Its natural formula soothes and deeply nourishes the very fine skin with each application, helping to reduce signs of fatigue. To know more about Atlantis Skincare, please visit here. 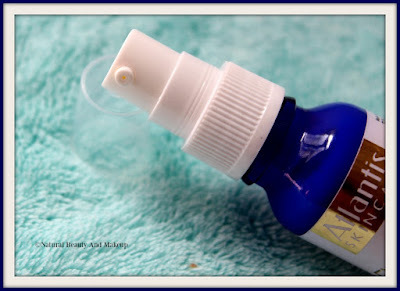 Dispense half a pump on the tip of your ring finger and gently apply on the eye area, starting from inner corners outward, morning and evening, before your face cream. Avoid direct contact with eyes. The benefits of each ingredient are mentioned clearly on the website to help the buyers 😊. Till date, to cure the under-eye redness, I have tried several eye creams ranging from medicines to drugstore brands. Although, I do not have severe dark circles recently noticed some fine lines around my eyes and who wants wrinkles at this age 😨? I am no expert still would suggest that if you want to reduce the early signs of ageing and under-eye dark circles then you must own a good eye cream and should start using it as soon as you observe certain changes around the eye area like fine lines, puffiness, pigmentation etc. Atlantis Skincare Eye Cream bottle comes in a small white cardboard packaging with golden details. Furthermore, the cream comes in a deep blue coloured small glass bottle with a pump dispenser protected by a firm cap. The pump system helps dispense the right amount of product and is convenient to use. What I loved about the Atlantis Skincare product packaging is you can find all necessary product details on both the carton and the containers! Even if you lose the outer packaging, you can still read the instructions on the bottle. Awesome! This product accompanied me during my recent Malaysia Trip hence it is travel-friendly too 😊. The eye cream is off-white in colour and has a lightweight, creamy texture with a semi-thick consistency. It has a faint herbal fragrance and spreads evenly on the skin. As per given direction, I dispense half a pump of this eye cream on my ring finger for each eye area. Then on my cleansed and toned skin, I apply the cream around my eyes, gently rolling from inner corner to the outer corner and around the brow bone. 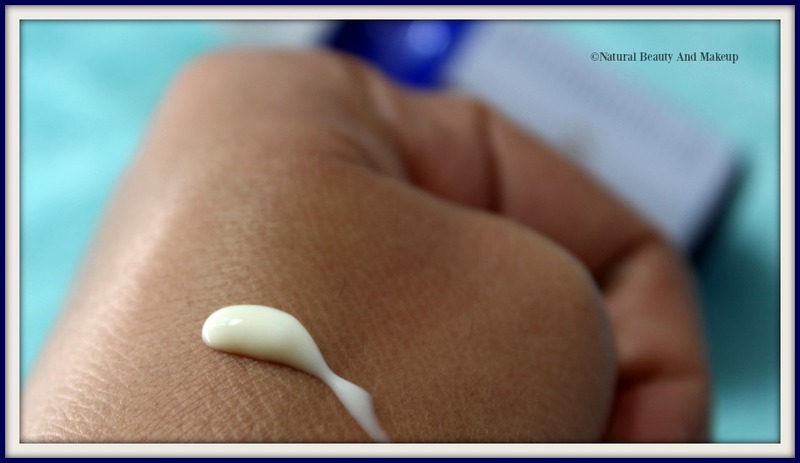 Try to apply this cream in a dabbing motion for better absorption and ensure that the cream should not be applied very close to the eyes and the lids as it might irritate the eyes. I use it every day and it’s a part of my day & night skincare ritual 😊. 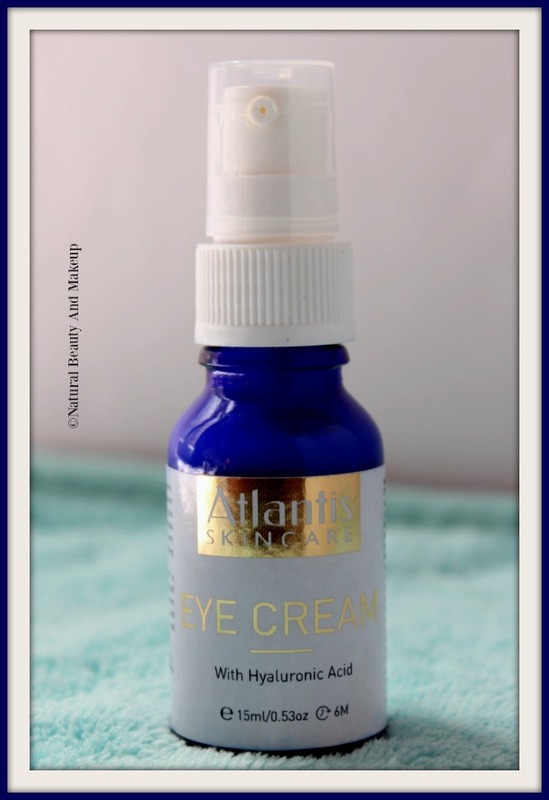 Atlantis Skincare Eye Cream has a smooth texture that gets absorbed into the skin pretty well leaving no excess greasy feeling behind. Interestingly, the cream is so hydrating that only the half amount of a pump is enough to moisturize the under eye areas. So this 15ml bottle is going to last me long! My advice would be to give it some time to get completely absorbed before you proceed with your next makeup/skincare step. With each passing day, I found it to be quite gentle and effective. I noticed a considerable reduction in my under-eye redness and those fine lines almost gone! So far it didn’t cause any irritation or breakouts hence I am super happy with this product 😊. Honestly, no cream can cure dark circles or puffiness unless we don’t take care of our own health. I stay awake at night (have insomnia) and that’s causing me some serious under-eye bags!! Thankfully, this cream is working like magic in keeping my under-eye areas bright and smooth 😍. Price is on the higher side! Availability is an issue in some places/countries at this moment! Better order from its official site. 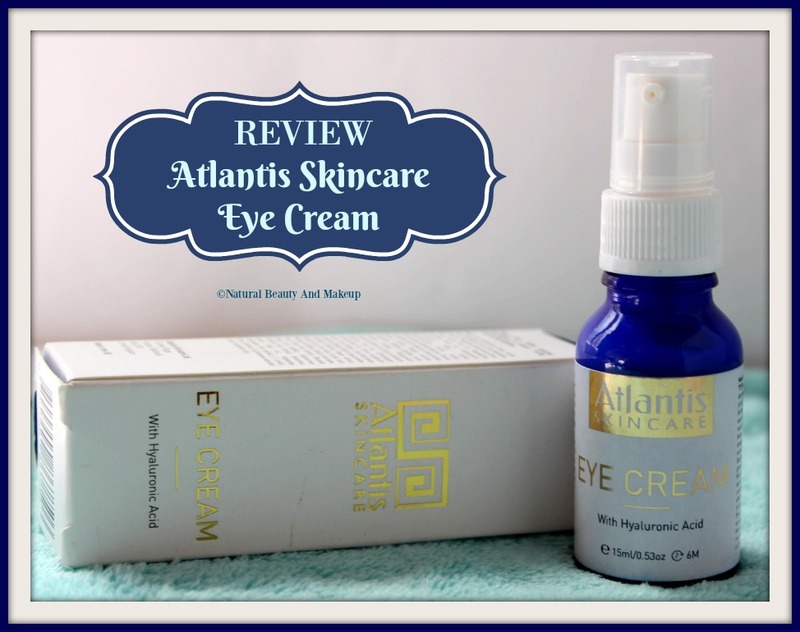 In short, Atlantis Skincare Eye Cream with hyaluronic acid is quite gentle, lightweight and an effective eye cream. It boasts of all skin-friendly, natural & organic ingredients to provide intensive care as well as anti-ageing benefits to our skin! As of now, the way it treated my skin issues, I am pretty happy with the output and hope with its continuous usage, all the under-eye related issues will be solved 😊. PS: I will surely update this post once I finish this product. The price is the biggest con here but if we can spend a hefty amount of money on cosmetics & outfits then why not skincare products 😊. 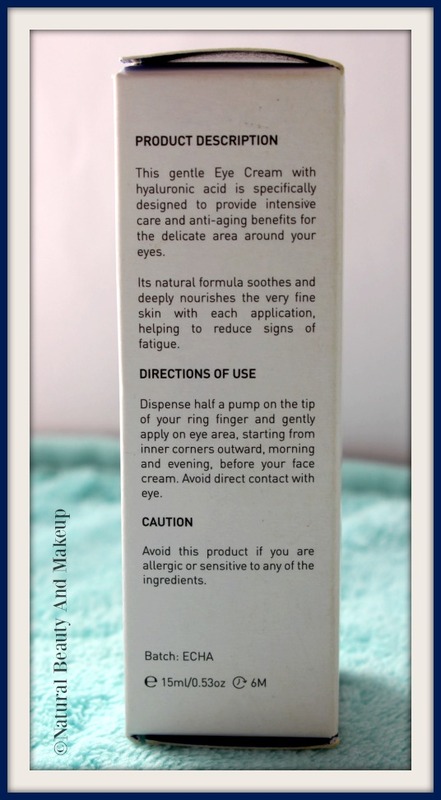 If you are keen on using natural products and looking for a lightweight, hydrating eye-cream to treat dark circles, puffiness, signs of ageing and fatigue, then this product is for you! I will definitely repurchase this and would highly recommend it as well. * PR sample but my opinions are 100% honest and my own. 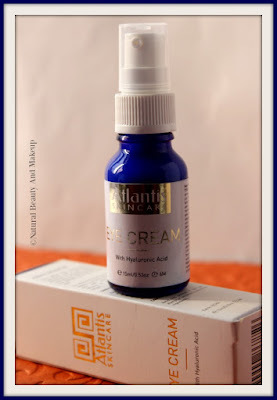 Have You Ever Tried Atlantis Skincare Eye Cream With Hyaluronic Acid? If Yes, Please Share Your Experience With Me In The Comment Section Below. Fine lines are gone and lightening of dark area is a good sign. Atlantis is a class apart brand actually. It will take time to diminish the dark circles fully as I don't get enough sleep (all my fault, of course) :( But, YES, YES, no fine lines any more, so happy :D I will update this post with more info, once I finish this product!! 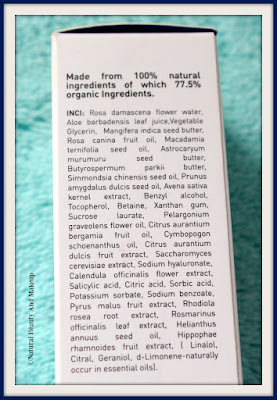 Exactly Soma, it's rich in highly beneficial ingredients! That is why it's working so good for my skin, I believe! I really need an eye cream. i have been looking for one since a long time. I would definitely love to buy this one. can you please let me know where can i buy this? Thank you Komal, you can order this product from its official website :) I have mentioned the link in my post, please check it once! That eye cream sounds really good. It's fantastic indeed <3 Thanks for stopping by! Sounds like the cream for me. Tell me about staying awake, for me, its also can't sleep. Btw, have liked your fb page, following on twitter and blogger followers. Appreciate, if you don't mind, the same. Thank you. That seems to be a great product! I am looking for something that works well on my tiny fine lines. I can give this a try! Seems to be a nice product. I will also suggest revitol eye cream. It is the one and all formula for all the eye problems one is facing. Apply it during the night and see the difference to yourself as soon as you wake up!